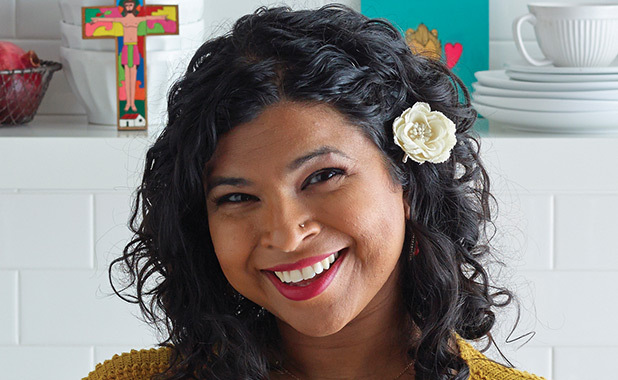 Food Network host Aarti Sequeira is known for two things: spinning her Indian soul into American favorites and her laugh. Armed with both, the former CNN producer won Food Network Star in 2011 and went on to host Aarti Party (a cooking show that grew out of the blog and YouTube show of the same name, shot in her kitchen with her actor-director husband, Brendan McNamara), Hidden Eats, and Taste in Translation. Her cookbook, Aarti Paarti, ranked in the top three Indian-Middle Eastern cookbooks on Amazon, outdone only by Yotam Ottolenghi. A judge on Guy’s Grocery Games and Cooks vs. Cons, she also contributes to Unique Sweets and competes on behalf of Postpartum Support International, the organization that helped her on the road to healing from postpartum depression. Catch her on NBC’s Today show, The Talk, Dr. Oz, and her podcast, Pass the Salt. She lives in Los Angeles with McNamara and their two daughters, Eliyah and Moses.